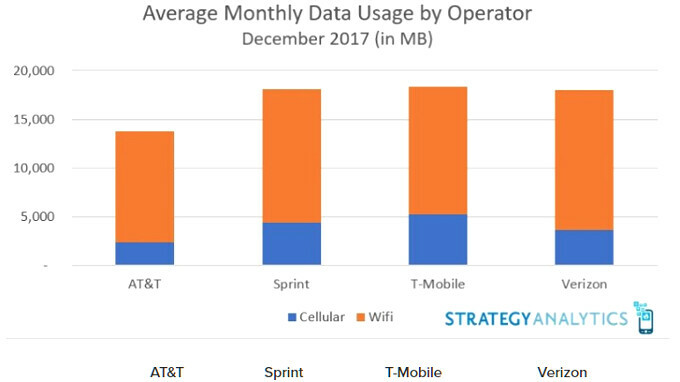 Not that it comes as a huge surprise, but folks on the cheapest unlimited mobile data plans - those of T-Mobile and Sprint - are using much more bits and bytes than those on the "expensive" carriers like Verizon or AT&T, says a new report from research firm Strategy Analytics. As you can see from the graphs below, T-Mobile subscribers are the absolute leaders in monthly data usage among all four major US carriers, with about 5GB on average, followed by Sprint at about 4GB, Verizon at 3GB, and, finally, AT&T with the modest ~2GB. This is for cellular data, though, as Wi-fi usage distribution paints a somewhat different picture, with Verizon taking the lead, followed by Sprint and T-Mobile. Needless to say, those on unlimited plans are the worst culprits in terms of average monthly consumption, while those with monthly quotas, or the pay-as-you-go crowd, consume much less. Given that "data prioritization" aka throttling kicks in at 20GB+, or even at 30GB of monthly usage for T-Mobile, those average numbers look pretty modest to us anyway, but let's not forget that they include all subscribers, even those without data plans, or with data cap limitations, hence humbler monthly outlays. I have been looking for a comcast alternative, i currently use Verizon and once i pass 15GB on my hotspot it slows to a crawl, if this is true i will switch ASAP. No one cares if you can "prove it". Using a lot of data doesn't make you special. ATT is worst of all. I have a unlimited choice plan and they de-priortize my data before reaching my limit during peak hours. I formerly used much more data on AT&T than I do now because most of my video streaming is through the DirecTV app. I was able to drop from a 30 GB plan down to a 10 GB plan because of this. I wonder if the "free" DirecTV data usage is counted in the number for AT&T data usage shown here? Beyond unlimited here in Verizon . Used 45 so far no problem, last month I used 110 no prob either . I regularly use over 65 GBs a month on Sprint. I've had my legacy 450 minute unlimited data plan over 7.5 years now. Zero data degradation and unlimited roaming. roaming within the u.s. or abroad too?